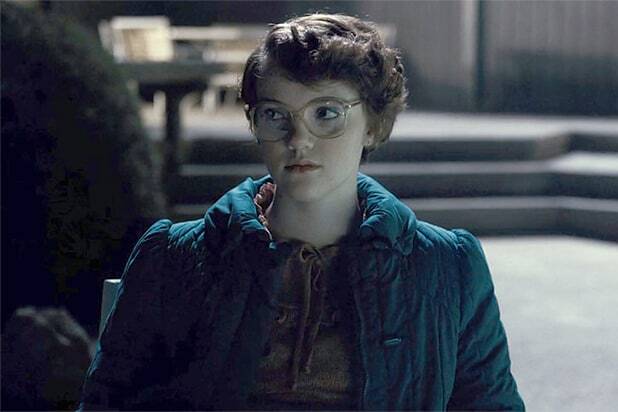 There may or may not be #JusticeforBarb in the second season of the Netflix hit “Stranger Things.” But there was definitely justice — or at least a lot of love – for Shannon Purser, the actress who played her, during the Netflix show’s Comic-Con panel in Hall H.
Purser surprised her former cast mates when she showed up to ask a question during the fan Q&A portion of the panel. As audience members get to the mic to ask a question, their image is projected onto the various giant movie screens inside Hall H so the audience can see and hear their question. When Purser appeared onscreen, it took a few moments for the audience to realize who they were looking at. But then, riotous laughter from the crowd and cheers from her former co-stars. Incidentally, Purser asked the question that’s on the minds of a lot of “Stranger Things” fans: will Barb return for season 2. Sadly, the answer is no. But happily, Purser was invited by the cast, and panel moderator Patton Oswalt, to join them onstage.